Do you remember that time when you met someone who simultaneously inspired and challenged you? That person who made you a little uncomfortable because they took you outside of your comfort zone; the one whose expertise and guidance helped you to achieve a goal you previously thought was unattainable. They were an “A” player and the kind of person you should be looking to surround yourself with. Before you make any changes to your team, step back and understand the philosophy behind my message. Do you want to live a mediocre life or do you want a life where you and those around you make the concept of impossible obsolete? Once you’ve decided that you want a fulfilling, challenging and rewarding life; examine who’s in your life and if they want the same things. We don’t get to choose our family, so hopefully you have one that supports your vision for your life. Outside of family, we generally get to pick who we spend time with. This includes our social circles, close friends, love interests and for those in leadership positions in their organizations, teammates. The minute I chose to surround myself with “A” players, my life started to look different. My vocabulary started changing. My way of looking at life altered. Things that I otherwise thought were difficult were now simply challenges that I was confident to take on. I have found that I’m only as powerful as the people I surround myself with. Why “A” players? Why not “B” or “C” players? I am a firm believer that progress promotes happiness. When we are moving forward, we get a sense of accomplishment that is central to living a fulfilling life. The “A” players of the world will aid you in your mission to be better today than you were yesterday. Additionally, an “A” player is someone who will make your life easier by taking on responsibilities and opening up possibilities that were previously unfathomable. There’s only so many “A” players in the world and if we’re all in competition for them, won’t the demand far outreach the supply? Yes, well kind of. While an “A” player is someone who is capable of being a superstar, they don’t have to be. Your first line likely has a superstar or two on it but what about your second, third and fourth lines? As long as your second line is comprised of the best second line players available, you’ve done an excellent job. Same thing with your third and fourth lines; so long as they are the best third liners and the fourth liners available, you’ve just filled your team with “A” players. The best want to be with the best and “A” players attract other “A” players. If we filled an open position with a “B” player, we may lose some of the “A” players we currently have. The investment in top-of-the-line talent is essential to not only helping your business thrive but also showing the next great potential hire that they want to play on your team. How many “A” players are on your team? Love the blog! It’s an incredible feeling to play on a team with “A” players, where everything is always possible! Leggendo quests blog mi sono venute in mente tutte le “A players” della mia vita. Questo testo mi ha dato una nuova visione delle persone che mi circondano, della C.C.C. e sì, anche della vita. Grazie mille come sempre Tony e complimenti per tutto quello che stai facendo e farai ! The more A players I get to work & play with the harder I push myself to become an A+ player! Great Blog! I love being a part of the A Team!! No truer words have been spoken!!! 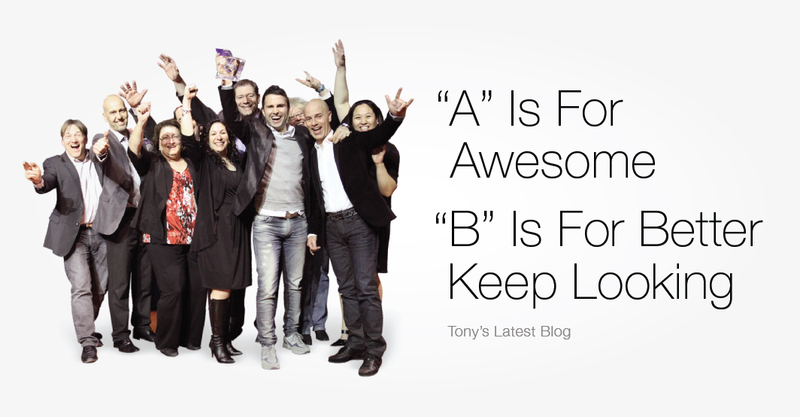 Great blog post, Tony! I am blessed to have A players on my team and also be part of a team that feels like family!!! Playing with “A” players forces you to continually challenge yourself and each other! Awesome! Playing with A team mates makes life easy. Great Blog Tony. It’s all about the “A” Team! People are not your greatest asset.. The “Right” people are… Great blog Tony! Playing with “A” players makes you want to push yourself harder and WIN! You don’t want to let anyone down on your team!! I am HAPPY to be surrounded by “A” players! Great blog Tony! Keep surrounding yourself with “A” players and you will continue to be successful and make Roma the place to be!! Loved this Blog because there is so much truth behind it! The momentum from all of our A players continually helps to move me forward! What an Incredible Blog Post! Amazing & So True! Roma’s Being Populated with Only the BEST! 🙂 Go Team! Awesome Work! Its not Easy to Do – But Definitely Worth It!